But, the impact had such a devastating effect on Earth by pure chance, scientists say. If it had struck a few seconds later or sooner, it would have caused much less damage and vaporization, so the non-avian dinosaurs would probably have survived. The reason is: sulfur (sulphur). The scientists who drilled into the crater found that the rock was rich in sulfur compounds. The energy of the impact (which is equivalent of about ten billion Hiroshima atom bombs) vaporized this rock, filling the air with a thick cloud of dust, similar to that created by a catastrophic volcanic eruption. This cloud blocked out the sun at least for a decade, and cooled the planet dramatically: even in the tropics the temperatures were barely above freezing, and the average global temperature was below 0°C (32°F). 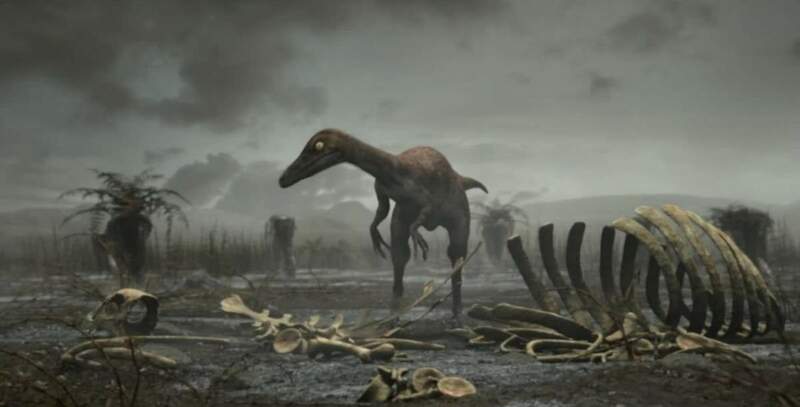 These events triggered what it is known today as the Cretaceous–Paleogene (K–Pg) extinction event, also known as the Cretaceous–Tertiary (K–T) extinction, and wiped out three-quarters of the plant and animal species on Earth, including non-avian dinosaurs. After the Chicxulub impact, global annual mean surface air temperature decreased by at least 26°C, with 3 to 16 years subfreezing temperatures and a recovery time larger than 30 years. The surface cooling triggered vigorous ocean mixing which could have resulted in a plankton bloom due to upwelling of nutrients. These dramatic environmental changes suggest a pivotal role of the impact in the end-Cretaceous extinction. On January 13, 2017, an article titled “Baby, it’s cold outside: Climate model simulations of the effects of the asteroid impact at the end of the Cretaceous”, published by the Climate scientists of Potsdam Institute for Climate Impact Research (PIK), revealed a detailed model of what happened to the atmosphere and the climate after the Chicxulub impact, and how the darkness and cold killed the non-avian dinosaurs. If the “Chicxulub impactor” had arrived a few seconds sooner or later, it could have landed in the deep water in the Atlantic or Pacific. That would have meant that mostly seawater -instead of sulfur- vaporized, causing less harm. The team which drilled into the peak ring of the Chicxulub crater in the Gulf of Mexico was led by Sean Gulick, professor of geophysics at the University of Texas at Austin, and Professor Joanna Morgan of Imperial College London. Prof. Morgan suggests that “100 billion tons of sulfates were thrown into the atmosphere. That would be enough to cool the planet for a decade and wipe out most life”. Prof. Gulick says that “the asteroid struck the Earth at a very unfortunate place – a concentration of sulfur-rich rock which vaporized, catapulting a light-reflecting cloud into the air – which effectively shaded the sun, dramatically cooling the planet, limiting plant growth and ultimately cutting off food supplies.”. This caused the extinction of non-avian dinosaurs which had dominated the Earth for more than 150 million years. The research project also established a new understanding of how big asteroid impacts cause the Earth’s surface to behave like a fluid. The previous scientific analysis suggested that such impacts deform the surface by melting most of the rock around the impact. Maybe the Chicxulub impactor hit the “worst possible place” for the non-avian dinosaurs and many other species, but, it may hit the “best possible place” for mammals, and of course for us, humans. Because, some animals, including many small mammals, managed to survive. In fact, mammals had maintained a low-profile existence for some 150 million years before that. The early true mammals were mainly small insect-eating creatures adapted to nighttime activity. They ranged in size from scarcely bigger than a bumblebee to squirrel-sized, keeping them out of the way of the predatory dinosaurs. After the non-avian dinosaurs have gone, the rise of mammals began. Just half a million years after the extinction of non-avian dinosaurs, landscapes had filled with mammals of any shapes and sizes. They acquired certain traits that would characterize mammals ever afterward: limbs positioned under the body, an enlarged brain, a more complex physiology, milk-producing glands, and a diverse array of teeth – incisors, canines, premolars, and molars. If dinosaurs were survived the Chicxulub impact, the humans probably would never become the Earth’s dominant species. In a new study, published on Science Daily and titled “Kunio Kaiho, Naga Oshima. Site of asteroid impact changed the history of life on Earth: the low probability of mass extinction”, two scientists from Tohoku University, Kunio Kaiho, Naga Oshima, reached the same conclusion. The researchers say that the probability of the mass-extinction occurring was only 13 percent. This is because the catastrophic chain of events could only have occurred if the asteroid had hit the hydrocarbon-rich areas occupying approximately 13 percent of Earth’s surface. But, the dinosaur-killer asteroid hit right in the “worst place” for dinosaurs. Chicxulub Impactor heated organic matter in rocks and ejected it into the atmosphere, forming soot in the stratosphere. That soot caused global cooling of 8-11°C and cooling on land of 13-17°C. It also caused a decrease in precipitation by approximately 70-85 percent on land and a decrease of approximately 5-7°C in seawater temperature at a 50-m water depth, leading to mass extinction of life forms including dinosaurs and ammonites. The largest impact crater on Earth is Vredefort crater in South Africa. It is 300 kilometers (186 miles) in diameter and the impact that created the crate was 2.2 billion years ago. The second largest impact crater is Sudbury crater in Ontario, Canada. It is 250 kilometers (155 miles) in diameter. The impact that created the crater was 1.8 billion years ago.